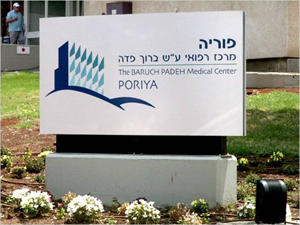 Poriya The Medical Center was founded in 1955 in Ramat Poriya, replacing Schweitzer Hospital. The Center contains a maternity hospital owned by the Scottish Church, previously situated in Tiberias. In 2005, the Medical Center was renamed and is now named after Prof. Baruch Padeh Z"L, previously the Ministry of Health Director-General and Hospital Director during the years 1974-1976. The Medical Center is located on Poriya Ridge above Tiberias, and serves the population of Tiberias, the Golan Heights, Jordan Valley, Lower Galilee, and various inhabitants from nearby cities, villages, Kibbutzim and Moshavim. A diverse population of Jews and various minorities of all religious denominations are served by the Medical Center , and includes ultra-orthodox, observant and secular Jews, as well as Arabs, Muslims, Christians, Druze and Circassians. The hospital provides the region's population with high-end and quality medical services, comparable to that of Israel's largest medical centers. The Medical Center takes pride in its quality and highly-skilled staff, its advanced hotelkeeping services and state-of-the-art medical equipment. We regularly strive to improve the quality of the services we provide to our patients - which we endeavor to render more professional and amiable. The Medical Center is amongst the first five governmental hospitals applying for the American JCI Organization's standard. We are currently ongoing the standardization process, and we hope to obtain approval upon its conclusion. This standard shall place the hospital in line with some of the world's leading medical centers, and shall facilitate the improvement of quality and safety standards implemented in theMedical Center. Currently, the Medical Center is undergoing an unprecedented period of development, following the renovation of its internal and cardiology wards, and its establishment of a catheterization and premature nursery unit. In 2011, we have opened a new Emergency Medicine Department (ER), and in 2012, we are expected to reinstitute the hospital's entire maternity department. The renovated department shall include delivery rooms, a maternity ward, an IVF unit and a high-risk pregnancy unit. At the same time, preparations are being made for Public Works Department works at the road leading to the Medical Center. The Medical Center employs more than 900 personnel, including doctors, auxiliary and paramedical employees and administrative and housekeeping personnel. Our personnel includes members of all religions and ethnic groups living in the region, and we take pride in the healthy, high-quality and harmonious relations maintained by our employees for many years. The hospital's achievements in all fields are many, and we strive for excellence in all medical fields and their related services. The increasing development of the hospital in the past two decades has been impressive. We are currently in the process of constructing a new emergency medicine department, which includes an underground hospitalization shelter, and a new maternity department, which will include delivery rooms, maternity wards, IVF services, high-risk pregnancy clinics, and more. This website will enable you to learn more about the hospital and our medical team. In addition, the site provides accurate information regarding the hospital's services and departments, and allows patients to secure clinic appointments, and to learn more about the hospital's diverse activities. You may contact us with any questions or requests you may have. The Medical Center affiliated to the Faculty of Medicine in the Galilee - Bar Ilan University, and as of 2011, the hospital's academic departments have been affiliated with the Galilee Medical School. This move is likely to upgrade the hospital's entire academic unit and is part of the hospital's ongoing process of improvement in quality and in services rendered by it. As a regional hospital, we consider it a duty to provide the population with health services of a quality and availability level comparable to that provided in Central Israeli medical centers, while maintaining an empathetic attitude towards our patients and their families - as evident by the patients' trust in the hospital.